Nicholas Allen Prenosil passed away under hospice care at his home. He was quadriplegic and home bound for all of his life. He was adopted at the age of 4 months and lived until he was 28 years old. Nicholas could not talk but answered questions with eye movements. He was the first of twelve adopted children and the catalyst for adoption of other special needs children, some of which preceded in death. 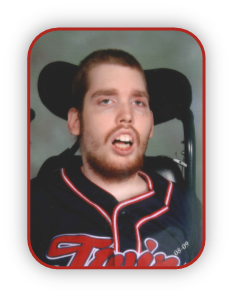 He was an avid Minnesota Twins fan. Nicholas was preceded in death by four siblings: Kateri, Robert, Gabriela, and Alicia. He is survived by parents, Joseph and Margaret Prenosil and siblings: Joseph (Kimberly) Prenosil V., Peggy (Doug) Ployhar, Melissia (Steve) Young, Daniel, James, Isaiah, Trevor, Kevin, Seth, Elizabeth, and Jacob. Funeral Friday, March 2, 2018 at 10:00 a.m.
Burial at Epiphany at 1:00 p.m.